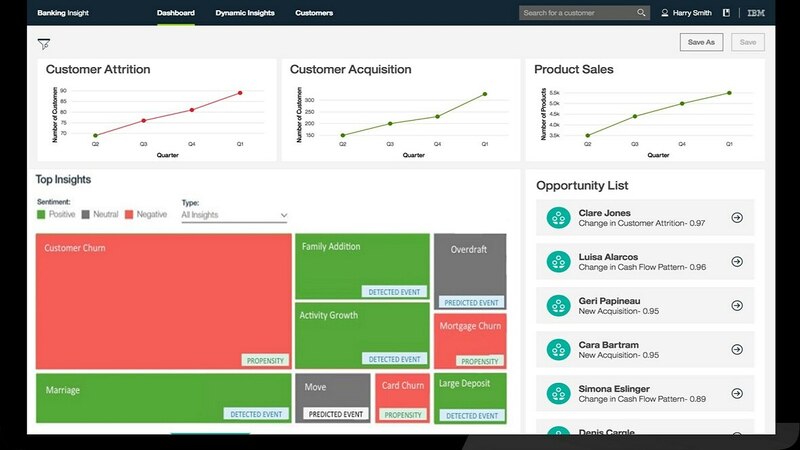 IBM Watson Customer Insight for Banking uses advanced prebuilt industry-specific analytic models that combine predictive and cognitive capabilities. The solution enables dynamic behavioral segmentation to uncover actionable customer insights allowing banks to create personalized sales offerings and marketing campaigns. The solution provides intuitive user interfaces and role-specific dashboards specifically designed for line of business users. Identify propensity to buy or cross/up-sell by determining the level of engagement for each customer based on their behaviors. Accurately predict potential life events for your customers to provide a proactive, personalized experience. Improve your ability to retain your most profitable customers by predicting attrition risks. Identify highly profitable customers for retention, marketing, and new product development.